The founder of Xuan Kong Zhang Pai School (玄空掌派) is Grand Master Lau Rui Shan and he has more than twenty-five years of extensive research on Bagua I-Ching and Feng Shui applications. Master Lau extensive researches reached a breakthrough whereby he managed to put together the missing pieces of ancient metaphysic. He has created a Chinese website (http://www.fengshui-chinese.com) for free to all practitioners around the world to share and learn from each other. His un-selfishness attitude is highly admirable but sad to say most of his works and creations were stolen, copied and labeled as theirs own findings. Without proper understanding or the rational of Master Lau theories will create a detrimental outcome if some of the methods were applied incorrectly. Knowledge is powerful but improper use of his knowledge deeply disappointed Master Lau. In order to pass down the message and methods properly Master Lau created this Chinese metaphysic school. He believed that everything he teaches can be found in a ‘palm, that is why the name of this school is Xuan Kong Zhang Pai. Master Lau observed the nature movements, stars rotations or orbits as well as the interaction among them. He found out that basic and fundamental theory is most powerful methodology to analyze and form hypothesis for a research base to next his findings. In other words, to understand Chinese metaphysic in natural way by observing the movements of stars and the interaction. For example, see the following picture. 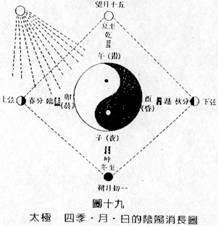 The Movement of Sun (solar) and Moon (Lunar) and earth which can be represented by Bagua and thus to form the forecast methods. The wonder of traditional magic Lok Shu square The sum of each line (whether vertical, horizontal or diagonal) always equals fifteen. The quantum number five in the center is powerful number and, if you ignore the 5 in the center, you will notice that the number opposite each other all sums up to 10. Wei, Jin, Ming, Qing and Song eras were generally considered to impact quite considerably in the history of Feng Shui evolution and the most far-reaching impact till today were the three classics novels: The Book of Burial, Green Bag Bible (scripture) and Heaven Jade Bible (scripture). The Book of Burial and Green Bag is said to be written by Guo Pu. Jin Shu only mentioned Guo Pu written and transcribed books such as: Jing Fang and Fei Yi, the Shan Hai Jing, Tung Lam, etc… cant seem to have evidence that The Book of Burial and the Green Bag was mentioned at all. Gou Pu early famous disciples Zhao works had been burned totally and that had let people to suspect that the Book of Burial was not in existence at all or bogus. However, Topography was indeed prevalent at the time; Jin Shu contained "Guo arrangement of funeral was spied by Emperor and such arrangement will bring ‘genocide’ to the owner” –implying that such arrangement exclusively for the imperial ruler. The Book of Burial: those buried had ignited the life-forces energy; the interaction of 5-elements created all living beings. The core of such message was a concept of Yin and Yang and the main 5-element that brings life form and creates existence. Since the late Tang Dynasty, Yang Jun Song emerged with one of his famous The Heaven Jade Bible (scripture), soon after in Ming and Qing Dynasties this book has become much sought after and popular. Yeh Qiu Chien footnote: The Heavenly Jade Bible discussed Three Guas and Four Scriptures of Big Xuan Kong, deal with specific topics such as identifying the true topography and specifically deal with Guas and 5-elements. Of course, various schools of thoughts have its own interpretation and uniqueness of such ancient text. No one knows which one is authentic! Many practitioners, be it amateur, scholars or professionals at that time were utilizing and very much proud of Yang Jun Song methodology and system. Regardless of what Feng Shui schools they belong to, either from San Yuan, San He our Xuan Kong, all were unanimously recognized him as the icon of Tang era Feng Shui. Nevertheless, this was a misconception with preconceived notion that require to be rectified. Tang era Li Shu Feng with The Core of Yin and Yang, and Yet Zi Jim, Master Yat Hang’s Da Yu Nien Far, Sheto Tou’s Water Method, Liu Pai Tou’s Submarine Eyes and Chen Ah Ho’s Sand’s Theory were popular at that time and even today is still recognized as classical works. Yang Jun Song other works includes Shock Dragon Scripture, Doubtful Dragon Scripture, and Black Bag Scripture and so on. Many scholars suspected The Heavenly Jade Dragon Scripture not his work. Yeh Chien Shen complied the scripture from 10 different residues versions and the final version came out to be an excellent version. History is not accidental, but in a cycle, in the Tang Dynasty's "Biography" Yang's work was not publicized as the same faith with Guo Pu, his work was not in a public record. But why is Yang Jun Song so famous and much sought after? This was pretty much attributed to the fact that Yang has many outstanding disciples that contributed positively to uphold his image and popularity. To name a few of his outstanding pupils are Liu, Lai, and Liao. Nonetheless, this is not a whole or totality of Feng Shui world. The geomancy is more than Yang Jun Song and some popular practitioners. All in all, one needs to learn from various angle of metaphysic in order to fully understand the world that is filled by cosmic changes. Today, I am passing my knowledge through Xuan Kong Zhang Pai School with the emphasis on Hai Ke Scripture that includes the Fu Shing Water Method or commonly known as Net Yin and Net Yang theory, which is also include the Heavenly Stem Adoption theory. Qiu has passed this knowledge to disciple Ding Yue, and then to Pu Tu Jian, to Zeng Wen Rui then to Famous Lai Buyi, Lai’s knowledge is symmetrically to Qiu Yen Han, this transmission carried on to Liu Yong Li, Liao Jin Jin and all the way to 20th generation to Suen Pou Kang. There after, things became unorganized and no proper records as who inherited the knowledge, in other words, the proper passing or transmitting the techniques was not properly done. In song era, Feng Shui practices were in a “topsy turvy’ world. With the emergent of Lok Shu magic square, Shao Yong’s Early and Later Bagua concept, round and square concepts had led metaphysic world into new horizons. Setting up of new schools of thought, changing the interpretation of ancient’s texts, shortening the period of identifying mountain dragon points set another milestone in Feng Shui philosophy landscape. The 64 Kuas concept became popular not by accident but by discovery. In Ming era, three unique sets of Feng Shui knowledge, nine palaces Hang and Chang Theory, The 3 Cycles and Nine Periods with 180 years in total. 64 Kuas method, Feng Sa method with San He 5 elements. Lai Buyi’s method since then became less popular, Prominent Feng Shui master Si Ji Shan’s Geographical know-how, Mu Jiang master famous compass school has evolved and became more and more popular at that time. Three famous masters in Ching era were Yeh Qiu Shen, Jiang Dai Hong, and Zhang Qiu Yi. Their works were commendable. But during that period mutually condemning each other shortfalls were rampant and were normal practice. Yeh Qiu Shen used the method more inclined to San He 5-elements and 12 Chang Shen water methods and Lai Buyi’s work promotion method as well. Zhang Qiu Yi used Lai Buyi Net Yin and Net Yang theory and Jiang Dai Hong used 64 Kuas and 3 Cycles and 9 Periods method. From the Xuan Kong time aspect, that has proven that Jiang Dai Hong could not have used the method. 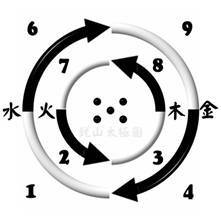 Until the establishment of the Republic, a group of the new division has emerged in the geomancy world, such as Shen Ju Ni’s Flying Star and Tam Yang Wu’s 2 cycles and 8 periods. After Second World War, the domestic conflict of politics has led many Feng Shui masters exiled to Hong Kong, among others like famous Ng See Jing and Kwan Fung Cheong. . As Hong Kong was a British colony but luckily the non-intervention and non-participation policies had helped many practitioners to find Hong Kong as their home. Since then, many have deeply rooted in Hong Kong, and the knowledge has developed and promoted to many Chinese communities like Taiwan, Singapore, Malaysia and so on. In the year 2008 at period 8, I am proud to announce the formation of Xuan Kong Zhang Pai School, we will have a base that is, among others, in teaching Jin Fang Bagua Palace and Heavenly Stem Adoption method (refer my Jin Fang Jie Chuan) with not only proven methodology but new findings and discoveries as well in today’s ever changing environment. We will have an open mind and heart, while retaining the useful methods and discarding the obsolete and outdated techniques. The fundamental is important and critical in learning new things. We will have to do away with superstitious practicing in this context with more scientific methodology. The simple fundamental and yet critical diagram is shown below.